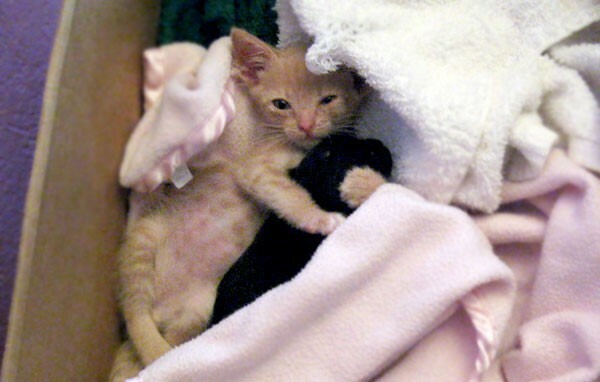 Ginger kitten lived on the street for 9 years without much food, a place to call home or any grooming to speak of. He had no one to care for him until he was adopted to a foster home where he was named Cheech. There, the kitty was groomed and was given a place to call his own and was taken to a vet to be checked out. The vet said that Cheech needed to be on a high-calorie diet because he had no food while growing up. Cheech grew stronger within days and was then introduced to 5 days old Chihuahua puppy named Casanova. Casanova was so tiny too and sweet and was even tinier than Cheech, and the pair became fast friends. Cheech and Casanova share much in common and that maybe the chance they became close at the end. They quickly bonded and Cheech would hold the little puppy, groom him, feed him, and even cuddle him as much as he could. It was incredible to see how caring Cheech could be when it comes to Chihuahua, they played together and even sit close to each other while watching TV or playing video games. When they were both tired they could stay in little Casanova’s box to cuddle and take a nap. Love this story? Share it.